San Diego based FanBox from mobile solutions company SMS.ac offers a variety of services. From its front page it offers a reasonable web desktop package, complete with wordprocessing, IM and online storage. A social networking service is included, and the holding company sms.ac offers premium SMS services. It sounds like a run of the mill package, except that like Plaxo in the past, FanBox spams potential signups by accessing the address books of its registered users. At least that’s what others have said, however I don’t recognize any of the names in the spam I’m now regularly receiving from the service, so it may well just be broad scale spamming of anyone and everyone. I couldn’t find a lot of history on the company (in particular who bankrolled it). According to Wikipedia, Sms.ac was founded in 2001 and has over 50 million registered users worldwide. As an SMS provider the company has been accused of spamming people in the past, and a search of our archives found mention of the company in the comment threads on the Plaxo spam posts. FanBox has been spamming people from at least the middle of last year. A search for “FanBox spam” in Google gives 5710 hits. Yvonna@ FanBox wants to be your loyal fan! Automatically sign in to view Yvonna@ FanBox’s profile and/or photo, and accept or reject her fan request. Karen asked you a question. View the question and answer it. Others have recommended that you should not click on FanBox links and most definitely not give them log in details for your email service. It’s wise advice. To be fair though they are not the only people spamming my inbox at the moment, I still haven’t got around to blocking emails from Facebook apps, but at least there you now have a reasonable path to block the emails. Instead of offering a simple unsubscribe method, clicking on unsubscribe from FanBox gives you a full page of options, and no easy path to unsubscribing. 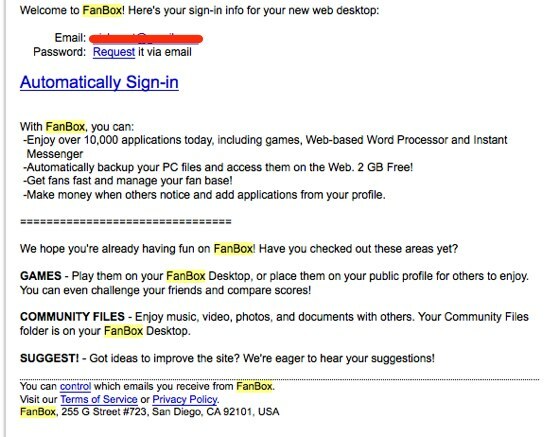 I’d be concerned that clicking on any link from FanBox may simply result in confirming your email address to them as well.